CCS-DS a new european design delegate conference unit, enabling participants to speak, register a request to speak, and listen to the speaker. 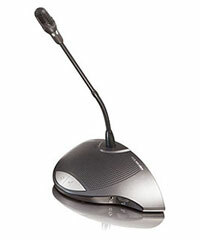 The microphone stem is extremely flexible, so the microphone can be used by delegates sitting on either side of the unit, thus allowing one unit to serve two delegates. The unit also accommodates two separate headphones, so the speaker can be heard clearly even in situations with excessive background noise. This aesthetically-pleasing unit has a built-in loudspeaker which is muted when the microphone is on to prevent acoustic feedback. Dimensions (H x W X D) 71 x 220 x 140 mm (2.8 x 8.66 x 5.51 in) (without microphone).